RM Series Safety Mounting Brackets help organize work areas, improve safety and ensure gas purity by eliminating the installment of a regulator directly onto a gas cylinder valve. 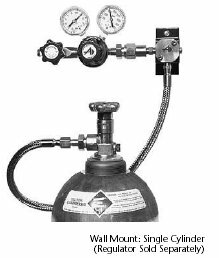 The fixed mounting of a cylinder regulator to an Advanced RM Series Mounting Bracket eliminates hazards incurred with regulator and cylinder during change-outs while allowing fast and easy cylinder replacement. The RM Series is available in wall-mount or bench-mount configurations to provide versatility to meet any application requirement. 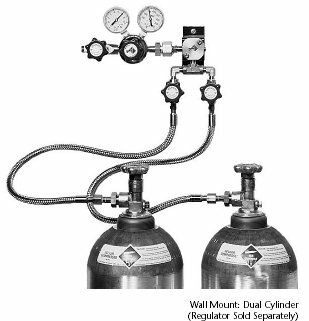 Both configurations are furnished with CGA outlets suitable for direct mounting of a single or two-stage regulator (sold separately) with matching inlet CGA connection. Note: Regulators are not included with RM Series. 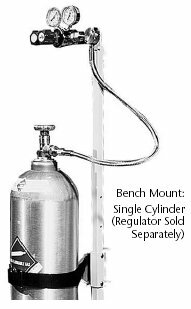 The bench-mount model includes a built-in cylinder clamp and adjustable regulator mast. Two diaphragm seal inlet isolation valves are provided standard with dual-cylinder wall mount models. Fixed Mounting eliminates recurring leaks, ensures proper regulator alignment and prevents damage to regulator. Bracket Dimensions allow for installment of single or two-stage regulators. Spare Access Port in Block provides versatility to install options such as pressure switches, valves or additional pigtails. Double Braided (all metal) Stainless Steel Flexible Hose maintains gas purity andprovides ease of connecting cylinder. PTFE -lined Stainless Steel Flexible Hose provides convenience while reducing cost (not recommended for high-purity applications). Check Valve prevents discharge of gas from regulator and pigtail during cylinder changeout. Purge and Vent Assemblies enhance system purity and operator safety. Flexible Hose (all metal): 30" long, 0.285"
To order a regulator safety mounting bracket, complete the part number using the "Part Number Key" above. For example, to order a single cylinder wall-mountin brass, with rigid pigtail, check valve and a CGA 580 connection, the part number would be RMW-B-1-CV-580. Regulator Safety Mounting Bracket Assemblies for acetylene service require flashback arrestors (SG6545). All assemblies ordered with CGA 510 will be billed and shipped with optional flashback arrestors installed on each pigtail, unless the order specifies with which gas it will be used. Advanced recommends the use of an optional purge and vent assembly without the check valve option when using toxic and/or corrosive gases. Advanced does not recommend the use of Teflon-lined stainless steel flexible hoses in bracket assemblies designed for oxygen service and will not provide such assemblies when ordered with CGA 540 connections. Advanced does not recommend the use of Teflon-lined, stainless steel flexible hoses with hydrogen or helium and with high purity applications. Although these gases are compatible with the materials of construction, experience shows that permeation through the PTFE core can occur. Equipment and Replacement Parts Part No. the part number. Example: SG6647-580. Order by complete part number.